Add to bath or massage onto skin after bathing. Bathtub may be slippery after use. Ingredients: prunus armeniaca (apricot) kernel oil, vitis vinifera (grape) seed oil, tritium vulgare (wheat) germ oil, fragrance, helianthus annus (sunflower) seed oil, rosmarinus officinalis (rosemary) leaf extract, tocopherol, glycine soja (soybean) oil, beta-carotene, canola oil, limonene. The Burt's Bees line for baby is wonderful. I have tried it all and I love this oil!!!! My baby gets a weird eczema like rash behind her knees, and in the creases of her elbows. This product has really helped her breakouts. The BB baby cream did not do the trick for the rash (but it is still a good moisturizer) I wish the company would make a liquid baby wash to complete the line of products. Try this oil...it smells wonderful and it is an all around good product. Burt's Bees Apricot Baby Oil is fantastic. 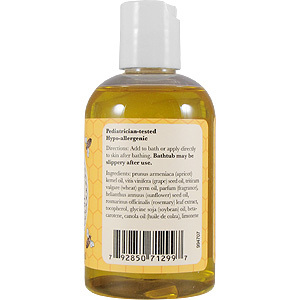 Its very moisturizing, gentle, and the smell is wonderful (think honeyed apricots). The product is thick and rich, which may require some additional application time (more time to pamper baby or yourself! ), but your problem spots will be silky smooth and delicately fragranced for hours. A little goes a long way. Great for bath time, or anytime when intense moisturization is needed. And added bonus is that it's 98% natural! Anonymous "We all love it!" We use this on our one-month-old son after his bath for a little baby massage. He loves it and we love it. Other products we've tried are really smelly and cause our son's skin to break out or flake. The smell of this oil is very light and pleasing and doesn't mask the wonderful clean baby smell that we love so much. We highly recommend all products in this line! Purchased this for my best friend who is on her 3rd child, and it works great for irritated areas, and smells FABULOUS! Nothing but positive feedback all three times! I always use Burt's Bees products, and as a result my boyfriend always says that I smell like something to eat. But, not in an overpowering way, in a fresh non-cloying way. This is another great Burt's Bees product with the most heavenly apricot smell. Rub into moist skin after you shower. It's very nice, good for babies too!!! I love this oil; I think it's the best out there. It smells sweet, and it makes your skin so smooth. I either put on right after a shower or pour in a capful of it in my body wash and it's divine! 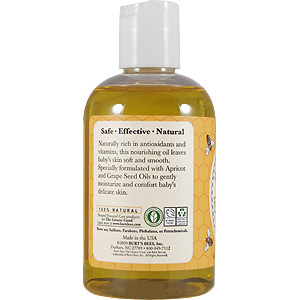 Baby Bee Nourishing Baby Oil is shipped in a discrete, unmarked package. Orders are processed immediately and usually take about 3 to 5 working days to be received. We do ask that you try it for 2 to 3 weeks to feel the full effects. Any information received is used only for order processing and shipping purposes. Your information, such as e-mail address, will never be disclosed to a third party.